Overview - Considered one of the greatest films ever made, The Rules of the Game (La règle du jeu), by Jean Renoir (Grand Illusion), is a scathing critique of corrupt French society cloaked in a comedy of manners, in which a weekend at a marquis’s countryside chateau lays bare some ugly truths about a group of haute bourgeois acquaintances. The film was a victim of tumultuous history—it was subjected to cuts after premiere audiences rejected it in 1939, and the original negative was destroyed during World War II; it wasn’t reconstructed until 1959. That version, which has stunned viewers for decades, is presented here. One of the most essential and defining characteristics of cinema is the simple cut. As pioneered and expanded upon by masters like Sergei Eisentstein in seminal works such as 'Battleship Potemkin,' various forms of film montage are an excellent means of forging meaning in images through an overtly formalistic and artificial juxtaposition of shots. As powerful as dialectical montage can be, it is far from the only cinematic technique at a director's disposal, and a slightly antithetical stylistic approach can be just as potent. 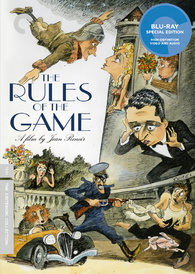 This brings us to Jean Renoir and his celebrated 1939 masterpiece, 'The Rules of the Game,' a biting, multifaceted satire on upper-class superficiality. As pointed out by many notable theorists including the great Andre Bazin, the film is not only home to intelligent social commentary and intricate character work, but also to a highly influential free-roaming camera. While Renoir does indeed use different types of montage to great effect throughout the picture, instead of cutting he often chooses to linger on extended takes, relying on a shifting, reframing camera and deep focus to sustain the illusion of reality. Meaning is implied not through the contrast of spliced shots but through the actual movement of the frame, connecting images within the same take. It is this fusion of timeless, intelligent content and influential visual style that really cements the film as such an important and treasured classic. The script is an ensemble piece that follows a group of bourgeois companions as they retreat to a chateau to enjoy a weekend of hunting and celebration. As the plot evolves, various love affairs and triangles develop between the wealthy aristocrats and their servants, revealing a turbulent, often comical web of relationships. Faint bits of compassion and honesty struggle to endure throughout the frivolous environment, and as the group adheres to the various social rules of their insular class, their rather shallow personalities and irresponsible actions all lead to an eventual, violent tragedy. Renoir injects the story with striking satire and uses his characters and plot as a means to form a humorous but enlightening treatise on the upper-class French society of the time. In many ways, most of the characters are merely overgrown children, seemingly inexperienced in real emotion or problems, instead choosing to engage in trivial, meaningless pursuits. The relationship between these noblemen and their servants also forms an interesting parallel, and in many respects these hired hands only end up mirroring the same playful emptiness of their employers. While the film is often described as a mocking indictment of such characters (and it certainly is) Renoir is far too gifted a storyteller to craft a purely one-sided work, and instead finds a way to both ridicule and cherish his creations. Through the writing and performances, the ensemble becomes ghastly yet endearing, reprehensible but charming. Their careless actions bring upon unsavory ends but their never seems to be any truly mean-spirited intent. This duality is a key component to the success of the picture and works hand in hand with many other contrasting themes and dilemmas that often sees unlikely pairings blossom among the characters. Bringing life to these complex, wealthy fools is a cast of excellent performers that includes the director himself. As the Marquis Robert de la Cheyniest, Marcel Dalio is fantastic, creating a nervous, insecure, child-like man that somehow remains elegant and charismatic. His fascination with old trinkets and toys works perfectly with the film's deeper themes and ideas, leading to a particularly brilliant shot full of visual subtext that features the Marquis introducing one of his most prized possessions. Nora Gregor plays the Marquis' wife, Christine, and provides a refreshingly cryptic performance. While her true intentions are uncertain for much of the running time, to me it seemed like all the character really wanted was for someone to whisk her away from all the nonsense surrounding her. Vying for Christine's affections is André Jurieux (Roland Toutain), a heroic pilot and true romantic. He clashes with the sensibilities of the bourgeoisie and only joins the festivities to try and win over his love. Other performers like Paulette Dubost, Mila Parely, Julien Carette, and Gaston Modot all round out the ensemble as various aristocrats, workers, and maids creating an all encompassing portrait of an entire, very isolated society. Under Renoir's guidance they all effectively lampoon their alter egos while still maintaining a level of likeability and believability. Actually, speaking of Renoir, it is the director himself who turns in one of the film's most moving performances. As Octave, Renoir presents a gentle and kind soul who seems to be very aware of the more ugly realities that define the various rules of his upper-class lifestyle. In many ways, the character becomes the heart of the story and is its most sympathetic voice. Complementing the comically rich characterizations and performances is the legendary French filmmaker's effortless style. Renoir uses the camera to great effect creating a classically composed work that offers an ambiguous visual quality. The director's appliance of deep focus allows the numerous layers of the frame to be used fully, staging action not just to the left and right, but in the foreground, middleground and background. Little details are constantly on display, allowing the viewer to choose which portion of the screen to focus on. The often roaming camera takes this aspect one step further, adding a level of movement to the proceedings. As the various characters populate and journey around the chateau we will frequently move from one person to the next without cutting, visually linking their personalities and plotlines together while maintaining an air of constant activity. Through his long takes and reframing images, Renoir presents a world that continues to exist beyond the borders of the screen. As the action escalates and the story takes on a more exaggerated tone -- with various characters feuding with and fleeing from one another during a party -- the clashing pieces come together like a hilariously orchestrated chess game. The roaming lens perpetuates the illusion that all of the various intersecting storylines and dilemmas are occurring simultaneously, while all the while, whether the camera is there or not, the party continues on unhindered. Like any true masterpiece, 'The Rules of the Game' is full of an almost limitless supply of material to discuss. The infamous "hunting" scene, for instance, in which the various aristocrats have their servants flush out rabbits and pheasants to be slaughtered without care, is a sequence worthy of an essay all its own. Or the extravagant and bizarrely intricate masquerade party and performance, featuring elaborate ghost and skeleton costumes that seem to exist for no other reason than to amuse the characters who wear them. All of these memorable sequences, multidimensional performances, humorous satirical observations, and inventive stylistic techniques, come together to form a perfectly balanced and executed piece of cinema. It is said that every cut is a lie, but by shifting the frame instead of jumping to a new shot, Renoir manages to prolong an illusion of truth in ways that traditional editing simply can't. By creating a visually and contextually ambiguous work, the director has crafted one of those rare films that benefits from repeat viewings. Each new watch may reveal details previously missed lurking in the background, or on the edge of the frame, or within a certain line or delivery, leading to an entirely different impression. As the story eventually works to a violent climax at the hands of the so called rules that govern the characters' lives, we are left with an ironic, "classy" tragedy that ranks high among the greatest films ever made. Criterion presents 'The Rules of the Game' in their standard clear case with spine number 216. When first released the film ran about 94 minutes but was cut to 81 minutes after negative backlash from audiences and critics. The original 94 minute version is unfortunately lost but an extensive reconstruction was conducted in 1959 that restored previously excised footage. Though Renoir was not directly involved in the edit, he did endorse the results and it is this 106 minute cut that is included here. The BD-50 region A disc comes packaged with an excellent booklet featuring an essay by Alexander Sesonske, writings by Jean Renoir, Henri Cartier-Bresson, Bertrand Tavernier, and Francois Truffaut, as well as tributes to the film by J. Hoberman, Kent Jones, Paul Schrader, Wim Wenders, Robert Altman, and others. The movie is provided with a black and white 1080p/AVC MPEG-4 transfer in the 1.33:1 aspect ratio. Considering the film's age and troubled history, the video looks very good but not quite impressive. The source is in decent shape, but there are periodic signs of noticeable yet not distracting damage, including vertical lines, specks, hairs, and scratches, along with some minor pulsing. A moderate, natural layer of grain is present throughout. Detail is OK but most of the film has a soft quality, though a few close-ups provide some strong clarity. Despite the softness, Renoir's use of deep focus comes through nicely in high definition and adds some welcomed dimension to many sequences. There are some instances where portions of the screen tend to blur slightly, however, and this seems to be a result of the film's age and restoration rather than actual focus techniques used during shooting. Black levels can be just a hair elevated in some nighttime shots but for the most part they remain deep and consistent. Contrast is strong with bright whites that don't overpower the picture. Considering the film's butchering upon release and the sad fact that many of the original elements were destroyed years ago, this is a very solid transfer. Though the image can be a little fuzzy at times, detail is still good and Renoir's highly influential style shines through remarkably well. This is probably the best shape we'll ever get to see this treasured classic in and it's certainly the best it has looked in decades. The movie is presented with a French LPCM mono track with optional English subtitles. Much like the video, the audio definitely shows its age but still manages to sound just fine. Dialogue is clean but features the trademark thin, faintly distorted quality that many films of this era exhibit. The single channel of audio does what it can with appropriate effects and score helping to further Renoir's lively and continuous atmosphere of upper-class frivolity. With that said, frequencies do tend to blur together when there is a lot of aural activity and there is no real low end presence to speak of. Thankfully, all of the elements within the mono track are balanced well. 'The Rules of the Game' sounds exactly like one would expect a 1939 film to sound. It's a bit flat and thin but that's to be expected due to the recording limitations of the time. Thankfully, none of these issues detract from the presentation in any significant way. Criterion has put together an excellent assortment of supplements, including some interviews, a documentary, a commentary, selected scene analysis, and an alternate ending. All of the special features are presented in upscaled 1080i with Dolby Digital mono audio and optional English subtitles (for the French portions only). Commentary written by Alexander Sesonske and read by Peter Bogdanovich - Filmmaker Peter Bogdanovich reads this commentary from Alexander Sesonske. The discussion focuses on an interesting and very detailed academic analysis of the film's themes, structure, and style on a scene by scene, shot by shot basis. Historical context is also elaborated on. Though the analysis can be a little overbearing and dry at times, the insights are certainly worthwhile. Renoir Introduction (HD, 7 min) - Here the director introduces the restored version of the film and discusses its initial failure upon release. Renoir details the controversy that arose due to the movie's subject matter and elaborates on its themes and influences. The filmmaker also addresses the cuts he made and the work done to re-include the excised material. Filled with wit and charm, this is a nice little preface to the movie that those new to the film should definitely check out before diving into the main feature. Playing by Different Rules (HD) - This is a fascinating look at the differences between the film's various versions, specifically the endings of the 81 minute cut and the 106 minute cut. The "Version Comparison" (13 min) presents both endings in split screen with commentary by Chris Faulkner as he explains the differences. The alterations are quite radical at times and the shorter ending provides a harsher, darker tone. The "Short Version Ending" (9 min) is also included in its entirety on its own. Scene Analysis (HD) - Chris Faulkner provides selected scene commentary on two sections. "Public and Private" (6 min) is mainly the opening of the film with a few shots from later portions thrown in as well. Faulkner provides an intelligent and academic discussion of Renoir's style, composition and themes. "Corridor" (3 min) focuses on a brief shot toward the end of the film that exemplifies the director's use of deep focus and strategic placement among different planes of the frame. Jean Renoir, Le Patron (HD, 31 min) - This is a French program from 1967 that features an extensive interview with Jean Renoir. The director discusses the film's style, themes, production, structure, characters, and improvisation. Renoir even returns to the exterior shooting location with Marcel Dalio to further elaborate on their characters. Filled with lots of interesting bits from the director himself, this is a great inclusion. Production History (HD) - Separate interviews with Chris Faulkner (8 min), Olivier Curchod (28 min), and Jean Gaborit & Jacques Durand (10 min) are included in this section. Faulkner provides a brief video essay on the film's production history and restoration, Curchod elaborates on similar information in much greater detail, and Gaborit & Durand provide some insight into how they went about reconstructing the film's lost footage. Interviews (HD) - Three more interviews are included here. The participants are set designer Max Douy (9 min), actress Mila Parely (16 min), and Renoir's son Alain (18 min). All of the participants focus on what it was like to work with Renoir and offer some great personal stories about the legendary director. Alain, in particular, offers some entertaining anecdotes about his father's personality and relationship to his renowned grandfather, Pierre-Auguste Renoir. 'The Rules of the Game' is a highly influential and important piece of filmmaking that stands proudly among the medium's greatest cinematic achievements. Through Renoir's complex, multifaceted social satire and free-moving, reframing camera, the director creates a darkly funny, tragic, and thought provoking piece of timeless visual storytelling. The video transfer and audio mix can't help but reveal the film's age but still provide a very solid experience. Supplements are exceptional and offer a comprehensive look at the movie's production and content. The film itself is a true masterpiece and Criterion has put together a disc worthy of its pedigree. This is a highly recommended title that, much like other defining works such as 'Citizen Kane,' is an absolute must own for any serious cinephile.